↑ "Caracteristicas da População e dos Domicílios do Censo Demográfico 2010 — Cor ou raça" (PDF). http://www.ibge.gov.br/home/estatistica/populacao/censo2010/caracteristicas_da_populacao/tabelas_pdf/tab3.pdf। আহৰণ কৰা হৈছে: 2012-04-07. ↑ 5.0 5.1 5.2 5.3 "Brazil". International Monetary Fund. http://www.imf.org/external/pubs/ft/weo/2012/01/weodata/weorept.aspx?pr.x=48&pr.y=11&sy=2009&ey=2012&scsm=1&ssd=1&sort=country&ds=.&br=1&c=223&s=NGDPD%2CNGDPDPC%2CPPPGDP%2CPPPPC%2CLP&grp=0&a=। আহৰণ কৰা হৈছে: 2012-04-17. ↑ UNDP Human Development Report 2011. "Table 1: Human development index 2011 and its components" (PDF). UNDP. http://hdr.undp.org/en/media/HDR_2011_EN_Table1.pdf। আহৰণ কৰা হৈছে: 2011-12-04. ↑ Mugnier, Clifford (January 2009). Grids & Datums – Federative Republic of Brazil. Archived from the original on 2009-06-21. http://web.archive.org/web/20090621192851/http://www.asprs.org/resources/grids/01-2009-brazil.pdf. ↑ 11.0 11.1 11.2 11.3 11.4 "Geography of Brazil". Central Intelligence Agency. 2008. https://www.cia.gov/library/publications/the-world-factbook/geos/br.html। আহৰণ কৰা হৈছে: 2008-06-03. ↑ "People of Brazil". Central Intelligence Agency. 2008. https://www.cia.gov/library/publications/the-world-factbook/geos/br.html। আহৰণ কৰা হৈছে: 2008-06-03. ↑ 13.0 13.1 "Introduction of Brazil". Central Intelligence Agency. 2008. https://www.cia.gov/library/publications/the-world-factbook/geos/br.html। আহৰণ কৰা হৈছে: 2008-06-03. 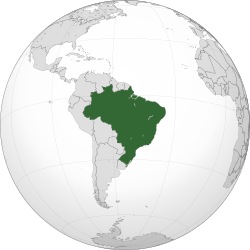 ↑ 14.0 14.1 "Brazilian Federal Constitution" (Portuguese ভাষাত). Presidency of the Republic. 1988. http://www.planalto.gov.br/ccivil_03/Constituicao/Constituiçao.htm। আহৰণ কৰা হৈছে: 2008-06-03. "Brazilian Federal Constitution". v-brazil.com. 2007. http://www.v-brazil.com/government/laws/titleI.html। আহৰণ কৰা হৈছে: 2008-06-03. "Unofficial translate"
↑ "Territorial units of the municipality level" (Portuguese ভাষাত). Brazilian Institute of Geography and Statistics. 2008. http://www.sidra.ibge.gov.br/bda/territorio/tabunit.asp?n=6&t=2&z=t&o=4। আহৰণ কৰা হৈছে: 2008-06-03. ↑ "CIA – The World Factbook – Country Comparisons – GDP (purchasing power parity)". Cia.gov. https://www.cia.gov/library/publications/the-world-factbook/rankorder/2001rank.html। আহৰণ কৰা হৈছে: 25 January 2011. ↑ Clendenning, Alan (2008-04-17). "Booming Brazil could be world power soon". USA Today – The Associated Press. পৃষ্ঠা 2. http://www.usatoday.com/money/economy/2008-04-17-310212789_x.htm। আহৰণ কৰা হৈছে: 2008-12-12. ↑ পৰ্টূগীজ Eduardo Bueno, Brasil: uma História (São Paulo: Ática, 2003; ISBN 85-08-08213-4), p.36. ↑ 25.0 25.1 Boxer, p. 100. ↑ 27.0 27.1 Skidmore, p. 27. ↑ 30.0 30.1 Boxer, p. 102. Alves, Maria Helena Moreira (1985). State and Opposition in Military Brazil. প্ৰকাশক Austin, TX: University of Texas Press. "Background Note: Brazil". US Department of State. http://www.state.gov/r/pa/ei/bgn/35640.htm। আহৰণ কৰা হৈছে: 2011-06-16. Bellos, Alex (2003). Futebol: The Brazilian Way of Life. প্ৰকাশক London: Bloomsbury Publishing plc. Bethell, Leslie (1991). Colonial Brazil. প্ৰকাশক Cambridge: CUP. Costa, João Cruz (1964). A History of Ideas in Brazil. প্ৰকাশক Los Angeles, CA: University of California Press. Fausto, Boris (1999). A Concise History of Brazil. প্ৰকাশক Cambridge: CUP. Furtado, Celso. The Economic Growth of Brazil: A Survey from Colonial to Modern Times. প্ৰকাশক Berkeley, CA: University of California Press. Leal, Victor Nunes (1977). Coronelismo: The Municipality and Representative Government in Brazil. প্ৰকাশক Cambridge: CUP. Malathronas, John (2003). Brazil: Life, Blood, Soul. প্ৰকাশক Chichester: Summersdale. Prado Júnior, Caio (1967). The Colonial Background of Modern Brazil. প্ৰকাশক Los Angeles, CA: University of California Press. Skidmore, Thomas E. (1974). Black Into White: Race and Nationality in Brazilian Thought. প্ৰকাশক Oxford: Oxford University Press. Wagley, Charles (1963). An Introduction to Brazil. প্ৰকাশক New York, New York: Columbia University Press. The World Almanac and Book of Facts: Brazil. প্ৰকাশক New York, NY: World Almanac Books. 2006.